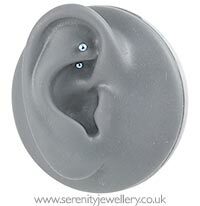 Hypoallergenic titanium curved barbells secured by 3mm screw-on balls. Available in 6mm and 8mm lengths. Also known as bananabells. Excellent quality titanium barbell. Fits my daith perfectly and looks great. This is the second item of jewellery I’ve bought from this website and I will defo be buying from them again. This item is just what I needed, it is light in weight and was just what I needed for my tragus piercing, which had been very sore prior to using titanium. Very good service too because they replaced items I did not like because of colour very quickly.